Treatment of intensive care patients is sometimes so poor it is contributing to their deaths, a watchdog has warned. Half of patients who died had had "less than good" treatment, and in a third of those cases it may have been partly to blame for their death, its study found. The National Confidential Enquiry into Patient Outcome and Death blamed delays in treatment and a lack of consultant involvement. It looked at 1,677 cases. NHS officials said the study offered only a snapshot of emergency care. The study, involving medical patients admitted to intensive care wards in June 2003, found junior staff were relied on too much. In 57% of cases reviewed, consultant physicians had no knowledge or input into the referral to intensive care. 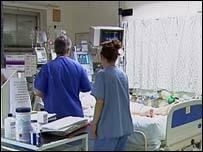 And once in intensive care, one in four patients did not see a consultant intensivist within 12 hours, the study said. Some 560 of the 1,677 patients from more than 200 hospitals across England, Wales and Northern Ireland died, although the researchers had sufficient data to determine the level of care on only 388. Watchdog chairman Dr Peter Simpson said consultants must become more involved and NHS trusts should ensure job plans allowed them the time to devote to intensive care patients. "This study is as much about facilities and resources as it is about clinical practice." The Intensive Care Society, which represents all professionals working in critical care, said: "Regrettably, many of these findings are unsurprising to British doctors, as compromises in care are common because of lack of beds, staff and equipment. "It is a source of considerable frustration and regret that these shortcomings continue to undermine the quality of care of the sickest patients in our hospitals." But Professor Carol Black, president of the Royal College of Physicians, said she was surprised by the findings and that they contrasted with data the college had collected. She said that consultants were working on average 60 hours a week and problems were being caused by a lack of resources. "The RCP said four years ago that physicians should be freed from other responsibilities on call." Royal College of Pathologists president Professor Sir James Underwood said he applauded the recommendations and added more post-mortem examinations should be carried out "so that complex cases can be fully and reliably investigated". Acting deputy chief medical officer Dr Bill Kirkup said: "This report only offers a snapshot of emergency care, obtained in just one month in one year, and there is no evidence to suggest this is typical throughout the NHS. "Overall care has improved for patients who are critically ill or are at risk of becoming critically ill."